After 5 days of varnishing, it has almost become a ritual. 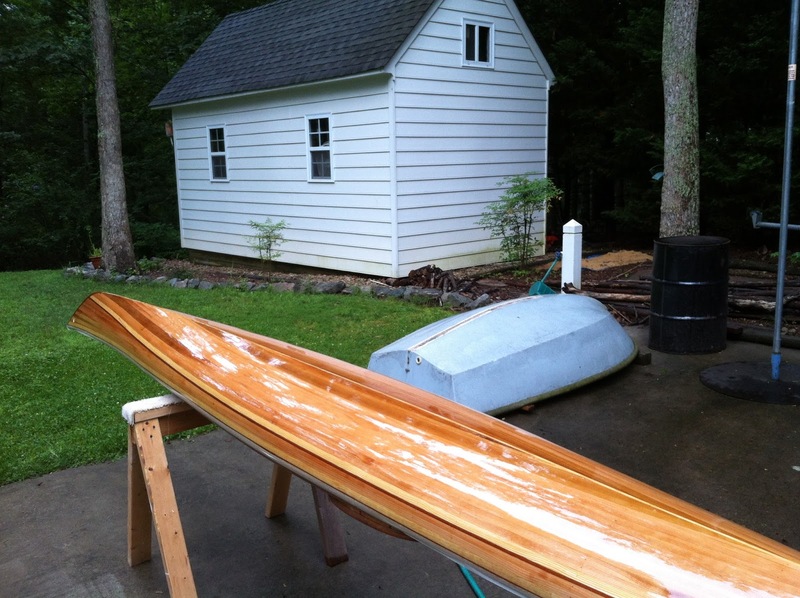 Early in the AM I have hauled the boat out of the garage to wet sand drips, sags, and errors with 320 grit. I find this doesn’t remove too much varnish and the water keeps the finish cool enough so it does not peel off the hull. Doing this outside doesn’t spoil the cleaned garage. A squeegee pulls off the water and then the boat goes back into the garage. Thankfully the damp weather has kept the dust down. I have been spraying the floor down, wipe the hull with denatured alcohol, and make 2 passes with a tack cloth. 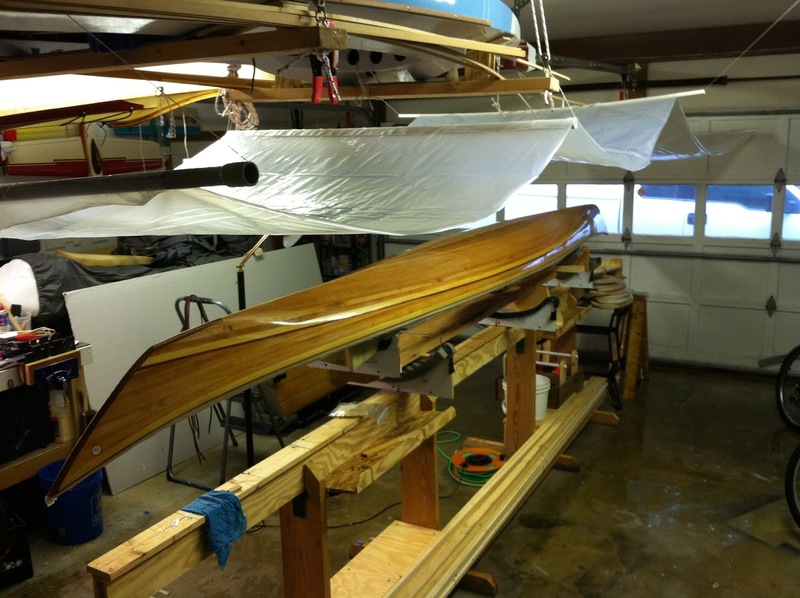 After the dust showing in the first coat, I rigged a plastic tent over the boat. Start on the hull. This allows for practice before the more obvious deck work. Taping along the shear leaves a clean line to work from the hull to deck. Typical masking tape worked fine. Thin the varnish. I added a cap of thinner to about a cup of varnish. This dramatically improved the flow. Use quality foam brushes. Wooster makes a good 3″ one. Smooth and no hairs in the finish. 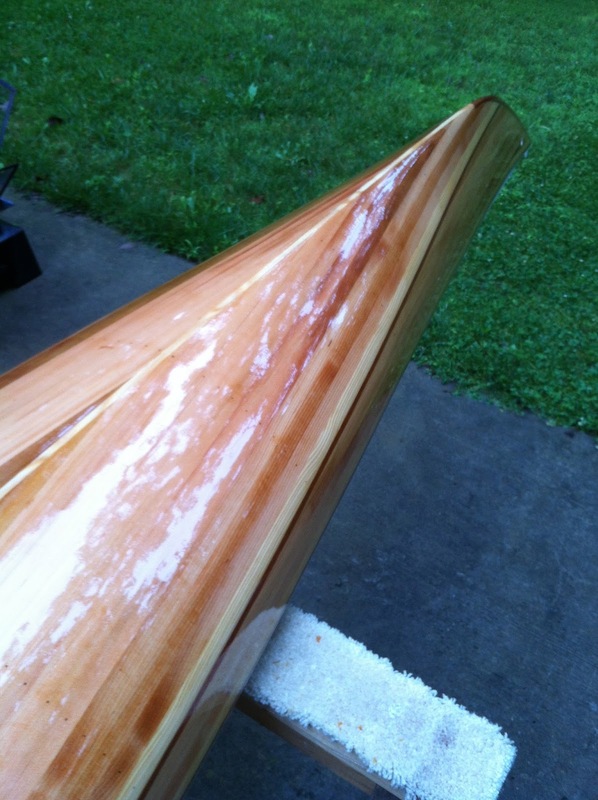 Lay on the varnish parallel to the keel down to shear. The stroke perpendicular to the keel down to the shear and finally stroke parallel again into the previously wet area. This helps level the coat and eliminate runs. Stick with 12″ – 18″ length portions to avoid having the finish skin over. 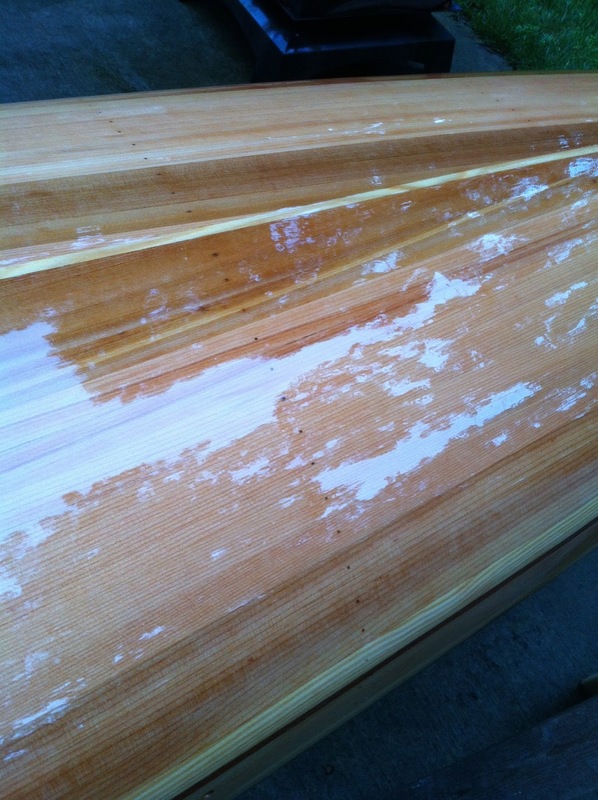 Allowing the varnish 24hrs to dry helps harden it enough for light sanding. By the 5th coat I felt I had gained some competence. There are a few sags there, but hard to detect. Now on to the deck and accessories.